It’s been up for a couple of weeks, but the Thankful Tree has been looking a little bit paltry. This puzzles me. My children eat multiple times per day, often while wearing clothes that are sometimes even moderately fashionable and sitting in a house that is, if not particularly spacious, generally pleasant and almost adequately heated. As if that weren’t enough, J is currently reading a novel about a traumatized girl whose best friend has died and M is reading a memoir by a quadruple amputee. In fact, other recent items from the girls’ reading list include Anne Frank: The Diary of a Young Girl, I Am Nujood, Aged 10 and Divorced, Words in the Dust (cleft palate in Afghanistan), Sold (human trafficking), and Between Shades of Gray (Siberian work camp). I am not even kidding. So you’d think that my children would be fully aware of their immense good fortune. The only explanation, I concluded, was that the process itself must be flawed. Oh, sure, you can mock me and say that I’m living in denial, but the truth is, we really were beginning to hit a fake leaf crisis. 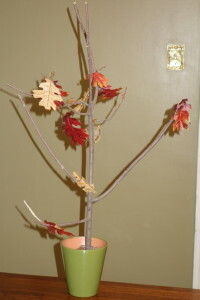 When we first started the Thankful Tree, it was with cute little construction-paper cut-out leaves. 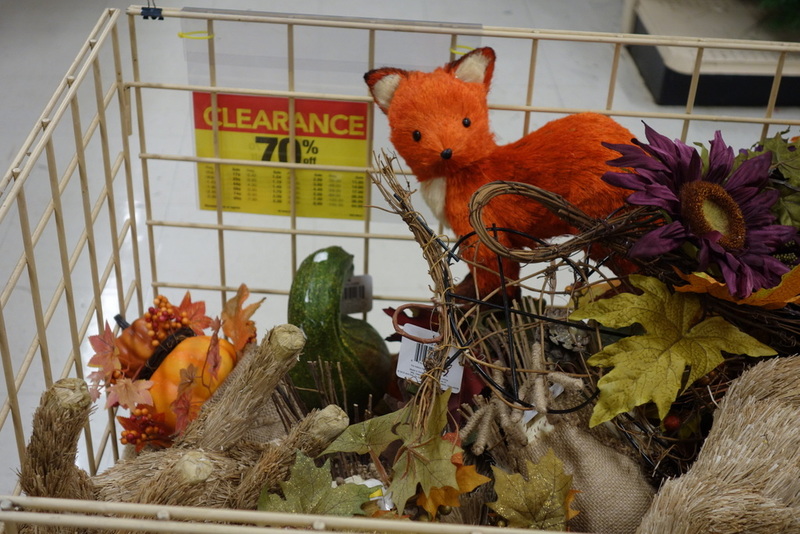 A couple of years in, I happened upon a clearance bin with ridiculously cheap garlands of fake leaves. I couldn’t pass them up, which is saying something, since you know I’m not a shopper or an impulse-buyer. It was a bargain that could not be ignored. 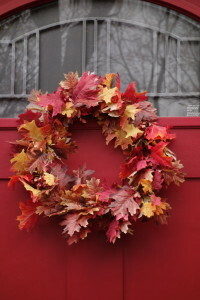 I used them to make an adorable autumn wreath. And then, there will still more of them, so the next Thanksgiving season, I ditched the construction paper and went with the fake leaves. They had little fake “stems” that could be used for hanging them, and they looked much more realistic than paper. 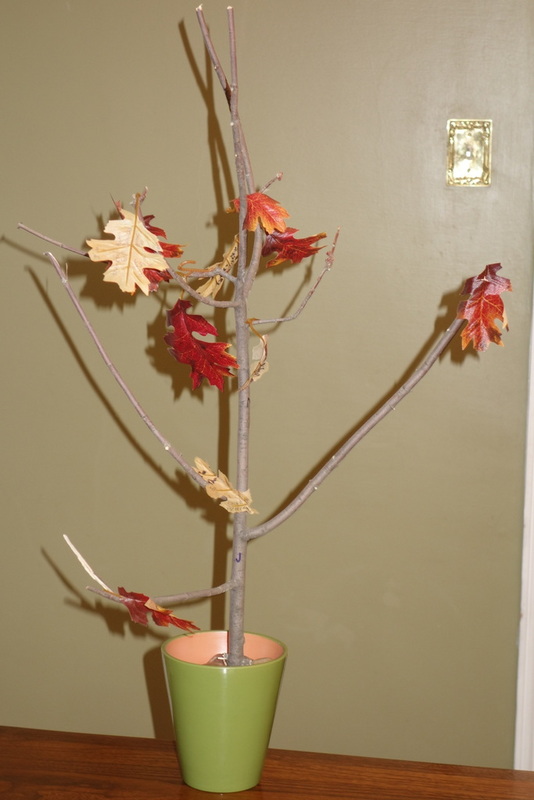 I was inspired to find a bigger branch, the tree was upgraded, and I was Thankful. But our leaf supply has dwindled. The only ones left from the bargain garland were small, bumpy, and stem-free, and even those were in short supply. 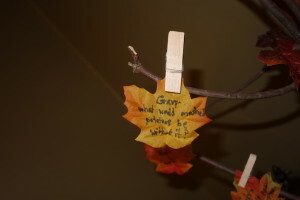 It was hard to fit thankful messages in between the fake leaf veins. And there was no going back to construction paper. I mean, that’s obvious, right? I needed some new fake leaves. I thought that this would be easy. Alas, I was wrong. I thought I was such a super-awesome planner, getting into Thanksgiving on the first day of November. But I was clearly behind the retail curve. I tried the grocery stores, Target, Party City, and Bed, Bath, & Beyond. 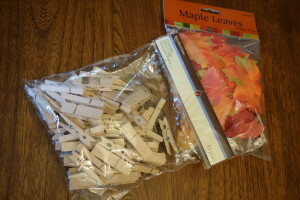 The closest thing to My Fake Leaf Vision were some packages of fake leaves at Party City, but they were awfully small, and the only way I could think of for hanging them on my branch would be to poke a hole in them with a needle and make a thread loop, and that sounded like way too much work. Then I headed to the craft stores—Jo Ann’s and Michael’s and A.C. Moore—and I started getting a little bit panicky. Every single store is in full-on Christmas mode. If there was anyone in the entire world who was still, I don’t know, thinking about planning for the holiday that is still a couple of weeks away, there was almost no evidence of such tragic losers in-store. 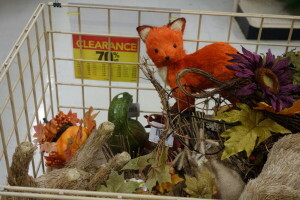 Each place had a token discount bin filled with the Land of Misfit Harvest Decorations, like a fox with a bad dye job and a fake squash with a chunk gouged out to show its tawdry foam-plastic interior. Finally, at Michael’s a happened upon a game-changer: adorable clothespins. My children are weirdly obsessed with clothespins. In fact, after I came home, I mentioned to M that I thought that they were “weirdly obsessed” with clothespins, and she argued with me, and I cited as evidence their frequent use of clothespins for photo displays and other examples of home decor, and that’s when I realized that she was arguing about being “obsessed.” She was obsessed, but this obsession wasn’t “weird” because, hello? Clothespins are awesome! So I picked up adorable little clothespins, then circled back to Party City for the little fake leaves (c. $3 for 70-odd leaves: me likey). And, can you believe it? The kids are clearly exhibiting increased signs of gratitude. And Cute W filled out a leaf stating, “I am thankful for this new leaf system.” Smartass. That is a really good idea. I might have to borrow it next year (it’s getting a little late to implement it this year). 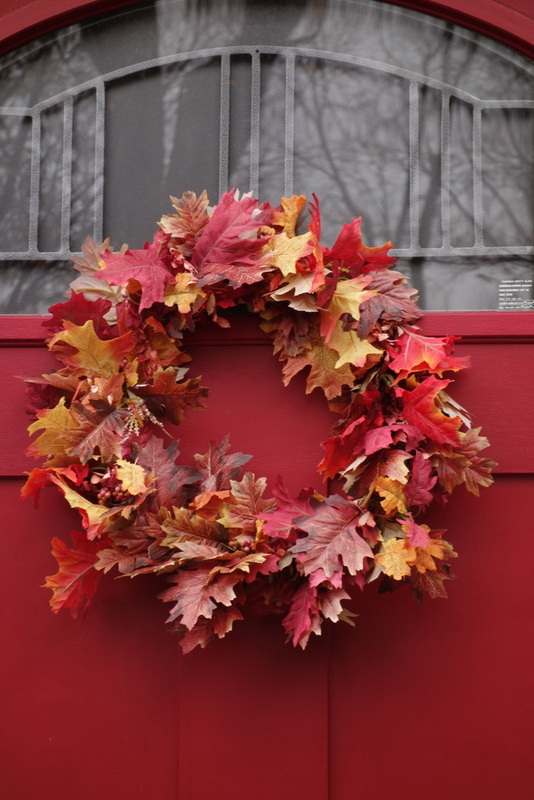 I love your wreath too!